This heavy-duty steel bracket mounts flush to wall and holds the redesigned Bose Lifestyle®, CineMate®, and SoundTouch™ satellite speakers. The speaker sits less than 6mm from the wall. An included integral connector makes it easy to attach your speaker. Does it work for Bose surround speakers 018SURSPKB ? The One Slide speaker connector is Brilliant. Not only does it SECURELY Fasten the wall speakers,,, the flush mounting allows the entire wall to channel the sound. 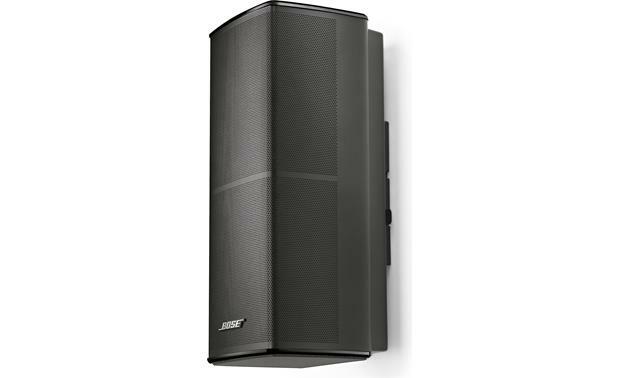 Overview: The Bose SlideConnect WB-50 is a unique wall mounting bracket for select Bose cube speakers. This high-quality steel bracket mounts flush to the wall and holds your speaker about 1/4" from the wall. The WB-50 includes a unique 2-pin speaker wire connector, and the mounting hardware you'll need to install the bracket. The package includes the bracket to mount one speaker. Mounting: The WB-50 mounts flush to the wall using the 4 screws and wall anchors (supplied). The speaker wire should be attached to the bracket at the two set screws prior to mounting the speaker. The WB-50 works with either in-wall or on-wall speaker wiring. The included 2-pin connector plugs into the speaker, and as the speaker is mounted on the bracket, the pins make contact with two strips on the bracket. The speaker is held in place on the bracket by four hooks that fit into slots in the speaker. The bracket can be installed vertically or horizontally depending upon the speaker you're mounting. Note: You should use the bracket itself, not the template provided in the manual, to mark the screw holes before drilling. I have 520 and floor stand. Is this the adapter need to mount it on stand? The stand has only 1 screw on top . will this work? No this is to mount speaker on the wall. My suggestion is to call Bose they will help you with the right parts. Does this fit over an electrical outlet box? Not sure. Mounted mine directly to the wall board with a small hole to snake the wire thru. Searches related to the Bose® SlideConnect™ WB-50 wall bracket .